Table 2 outlines the PerfMon counters that are key to gathering information about memory availability and consumption. SQL Server read/write performance is closely related to the ability of Windows to retrieve and write data pages to disk efficiently. Efficient and timely data access is dependent on both configuration-based and schema-based factors, such as data and log file sizing and placement, useful indexes, and index fragmentation. Disk and storage performance can be a hugely complex and protracted exercise, and one that is often confused by unclear terminology and logical abstractions that make it hard to identify root cause. However, regardless of storage hardware, disk layout, or path configuration, the only aspect of real interest is the time required to read or write from disk because this is a great indicator of whether disk access performance is likely to cause SQL Server problems. Typically, once disk access has been identified as a bottleneck, tools more specialized than PerfMon must be employed to provide a lower level of detail on bottlenecks. Most SAN vendors provide performance-monitoring tools that help diagnose issues with storage controllers, cache performance, and physical disk service time. These tools provide further diagnosis on the over-utilized component and performance bottleneck. Disk performance problems have wide and varied potential resolutions, including extensive disk reconfiguration, such as changing RAID level, disk group membership, and strip size. You can also make many enhancements within SQL Server, including right-sizing data and log files; pre-allocating space; and, for very large databases, table partitioning. Table 3 describes the main PerfMon counters to check for disk performance. Sometimes server hardware resources do not cause bottlenecks, but application performance is still bad. In this situation, it’s possible that internal SQL Server resources can become exhausted or depleted. 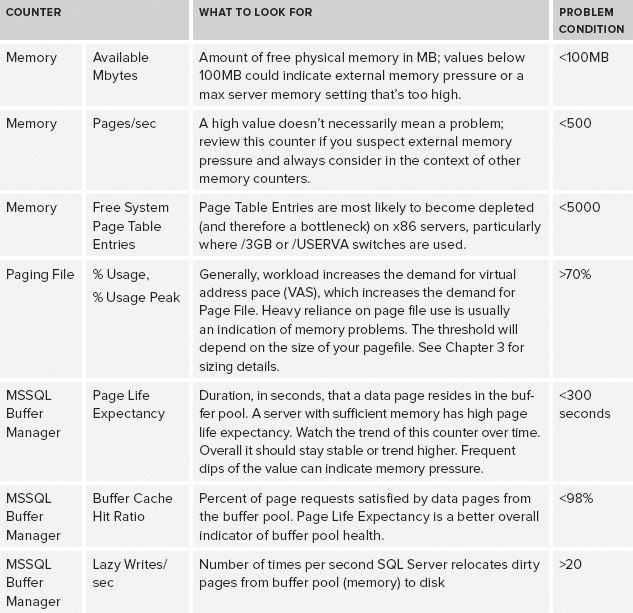 Table 4 describes the principal counters for monitoring internal SQL Server resources. Although it may be easier to access these wait stats from the DMVs within SQL Server, collecting them as part of a system-wide data-gathering exercise with PerfMon minimizes the logistics effort involved in collecting the information. A performance baseline is simply a PerfMon log from a time frame representing “normal” performance, retained for future review. The PerfMon log should contain counters that build a complete picture of hardware and SQL Server resources during a representative workload period. The performance baseline can provide answers to questions that an individual would otherwise be unable to answer. 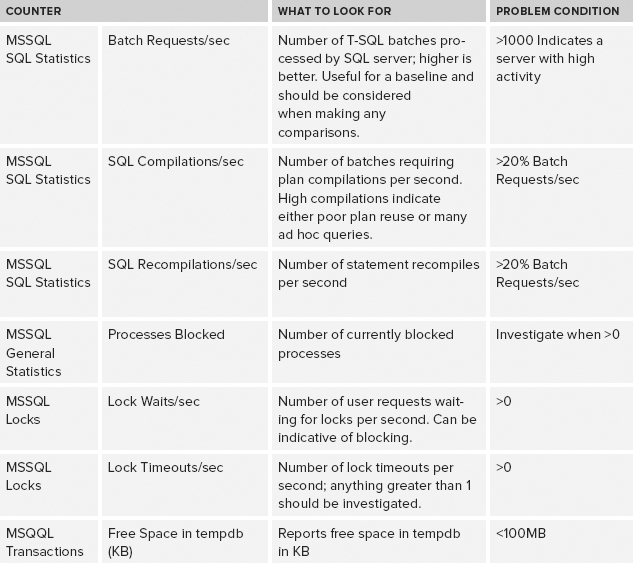 On occasions when there are any performance problems, the baseline is available for comparison; and by mapping the SQL Server batch requests per second against other values, it will be possible to identify and compare problem server activity per workload with the workload of a known good data capture. The baseline should be continually maintained; otherwise, configuration changes or tuning optimizations could alter the output and invalidate any comparison. It’s useful to get into the habit of taking a fresh baseline on a regular basis.